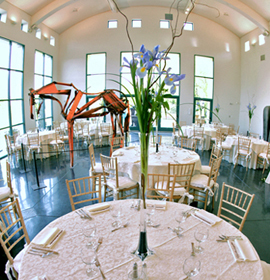 Located in scenic Julia Davis Park, the Boise Art Museum (BAM) is Boise’s ideal venue for sophisticated dinners, cocktail receptions, employee appreciation events, recognition celebrations, and family gatherings. Surrounded by exceptional art and historic architecture, you’ll be inspired and so will your guests. BAM’s indoor Sculpture Court is a truly unique space for your corporate or private event. With innovative installations of original artwork, the ambiance in BAM’s Sculpture Court is elegant yet vibrant, providing guests with engaging visual arts experiences. BAM’s Sculpture Court features 26-foot ceilings and large, light-filled windows. 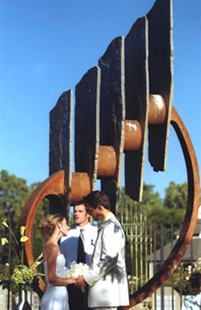 BAM’s enchanting Sculpture Garden, located behind the Museum, is perfect for your next outdoor event. With views of the surrounding park and the Julia Davis Rose Garden, this extraordinary space features several iconic BAM sculptures, providing an incomparable setting for your corporate, social, or family gathering. Host your wedding and reception at the Boise Art Museum for an experience beyond compare. Choose from BAM’s Sculpture Garden with its one-of-a-kind sculptures and views of the Julia Davis Rose Garden, or BAM’s Sculpture Court with its vaulted ceilings and grand atmosphere. The Museum is available for weddings from October through June. We offer competitive rates to suit your specific event needs. Pricing packages range from $600 – $2,500 and are based on the number of guests, day of the week, and type of event. Basic rental fees include up to a 5.5 hour event. Please note that events are to begin no earlier than 6:00 p.m. and must conclude no later than 11:30 p.m. Please call for additional information. We are delighted to offer a 20% discount to Incorporated Non-Profit 501(c)(3) Organizations. Pricing packages are based on corporate rates. Basic rental fees include up to a 5.5 hour event. Please note that events are to begin no earlier than 6:00 p.m. and must conclude no later than 11:30 p.m. Please call for additional information. We offer weddings for a rental fee of $2,500. Wine and beer service or liquor service may be included for an additional fee. Weddings may take place from October through June. Civil ceremonies only are permitted. Basic rental fees include up to a 5.5 hour event. Please note that events are to begin no earlier than 6:00 p.m. and must conclude no later than 11:30 p.m. Please call for additional information. 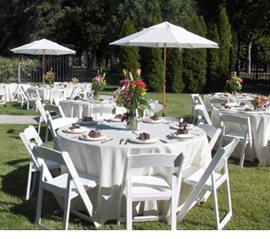 • Basic setup service for tables, chairs, and linens. Additional setup services are available for an extra fee. Please call for additional information regarding services and fees. • Museum security staff, maintenance, and custodial labor. • BAM does not permit the use of the premises for fundraising events benefiting other organizations, political events, religious ceremonies, memorial services, and other events that are open to the public, including ticketed events. • The Museum is unavailable on major holidays, the first Thursday of each month, and during scheduled Museum or private events. Please call for availability. • Rental fees are subject to 6% Idaho Sales Tax. Make it memorable. Make it BAM. Our staff has a passion for creating memorable experiences. Let us help you organize an unforgettable event set against a backdrop of exceptional art. For all event inquiries, please complete a BAM Event Application and submit it to events@boiseartmuseum.org.